probably the best pre-valentine’s day, ever. 12th February 2011 marks a special milestone for R-AGE @ GII. I think any youth pastor would have been proud; I was delighted with the commitment of the young people, and I was filled with gratitude to belong to and lead this precious youth group. The last time I preached at GII, I casted a vision of seeing 150 youths in service by the end of 2011; at that first service of the year, we surprised ourselves and counted an attendance of 135. This afternoon, we broke the record (by a mile!) and counted 162. Praise God for these mind-blowing numbers! I also witnessed a new performance band rising up. New songs, styles, vocalists, musicians and anchormen only meant one thing – we are indeed regenerating. R-AGE, do you have any idea how much talent God has blessed us with? (And FYI, the band has only rehearsed for a couple of weeks!) I believe there’s so much more to come from these creative individuals. But the best thing for me was to see the band thoroughly enjoying themselves… That’s the way to do ministry – having fun! It was also a sight to behold, seeing one of the highest attendances for PUSH; 20 youths praying until something happened… And I think God answered our prayer in His own special way. I was thankful that God held back the torrential downpour until service started! And man! I haven’t even gotten down to the transformation of the GII Chapel – it looked so pretty today! Thanks to the commitment of the youths, this is the nicest I’ve ever seen the hall look. 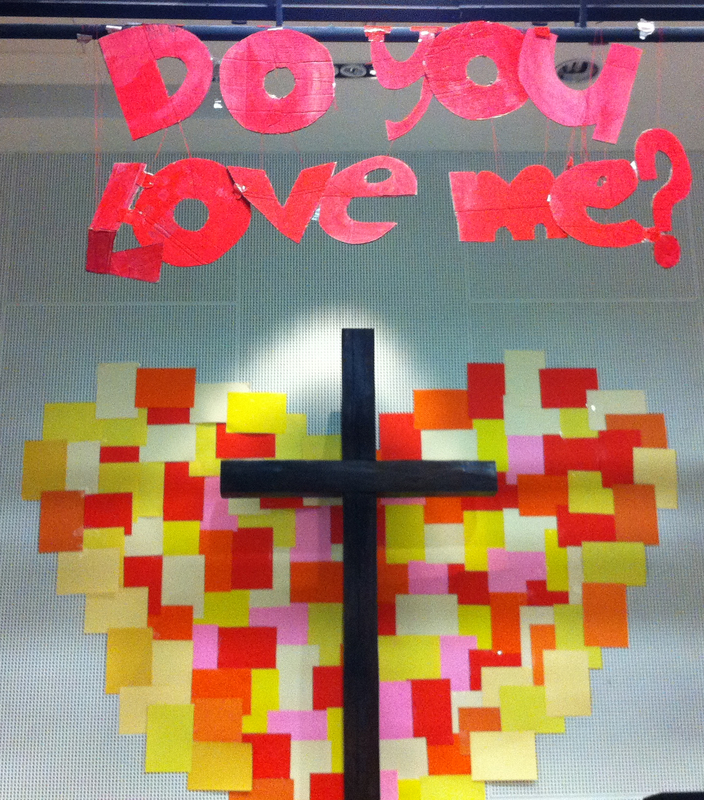 From the candle-lit structure to the tables and chairs laid out outside Chapel, to the paper heart behind the cross, to hearts and posters pasted on the walls, I was visually captivated and comprehensively impressed by the massive amounts of effort put in by the decoration team. And speaking of pretty, did you all check out the lovely cupcakes? 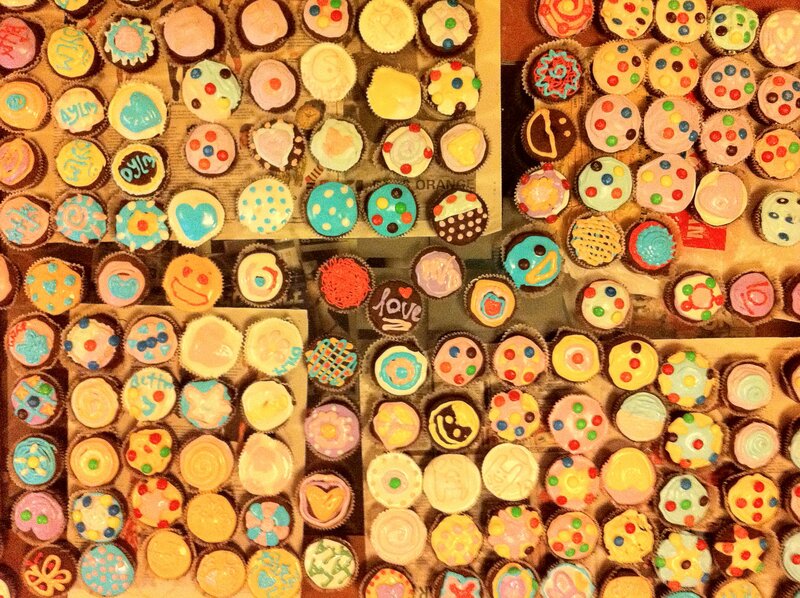 It was lovingly baked, designed, prepared and packed from 3pm to 2am the day before… And every single cupcake has a unique design – no two were the same – that’s how special each one of these youths are to God (and to me)! Here comes the exciting part… In all my 14 years in R-AGE services, I’ve never seen so many newcomers before… Today, we said hello to 25 visitors! That’s an amazing count by any measure! I’m so proud of the youths for making such a genuine attempt to invite their friends. I remember saying this during the debrief – “We may have 25 newcomers today but considering how many youths have had their friends reject them, I am convinced, easily a 100 could have been invited.” The hearts of our young people are indeed in the right place. Praise God! But the best part of today was reserved for the three souls that returned to God – two first-time salvations and one rededication! This made all the effort worth it… I remember sending an encouragement SMS to those who were serving – that “may the fruit of their labour result in souls added to the kingdom and lost ones returning to the Father.” We praise God for He is faithful indeed. I can’t wait for the next big event that R-AGE @ GII will plan – a revival that will take place in mid-May. This will be a combined youth service on a Saturday evening at the GII Sanctuary. Let’s look forward to an awesome evening of worshipping God at full volume with the entire R-AGE family… And perhaps with even more newcomers! God: So, do you love Me? R-AGE: Yes, we do and will feed Your sheep. ten dominant thoughts to sleep on. 1. REAL 2011 is likely to be my final batch; I must treasure my remaining time with them and be thankful instead of being frustrated or disappointed. 2. I look forward to heading the youth conference this year-end with a team of youth leaders. Things will change – I guarantee revolution, no less. 3. I will never stop believing in young people; if you don’t – that’s your problem – don’t make it mine; I see potential differently from the way you do. 4. While youth ministers must get comfortable with going the extra mile and not receiving any appreciation for it, it doesn’t mean they should get used to it. 5. Which is worse – realising that you are not putting in your best or realising that your best is simply not good enough? Shortchange or sub-standards? 6. So, I am mildly stressed – with the coming mission trip, a potentially life-changing meal and my first evangelistic sermon this Saturday. Lord, how? 7. I’m dichotomous when it comes to friendship – fiercely loyal to those whom I love and have scant regard to those whom I’ve lost respect for. 8. I joined full-time ministry to do pastoral work, not administration; God, I need mercy and patience for incompetency, inadequacy and incompatibility. 9. The antithesis of my life – apathy, superficiality and doubting young people – I don’t want to be associated with these traits or people who possess it. 10. Good is the enemy of great; don’t ever settle, get complacent or think that you’ve arrived – pride goes before a fall. Always a good reminder for all.